Sales reps receive customized daily mini-games that teach topics such as features and benefits, how to compare competitors and objection handling. Drive’s analytics engine helps players assess their strong and weak areas. It also shows managers which reps need coaching. Drive adapts to each learner over time to help them master their weaker areas and build on their strengths. Help sales reps build confidence & competence in just minutes a day. Drive is a training reinforcement tool for sales reps. Learners complete a short confidence assessment, then receive customized daily mini-games that teach topics such as features and benefits, how to compare competitors and objection handling. Drive adapts to the learner over time to help them master their weaker areas and build on their strengths. 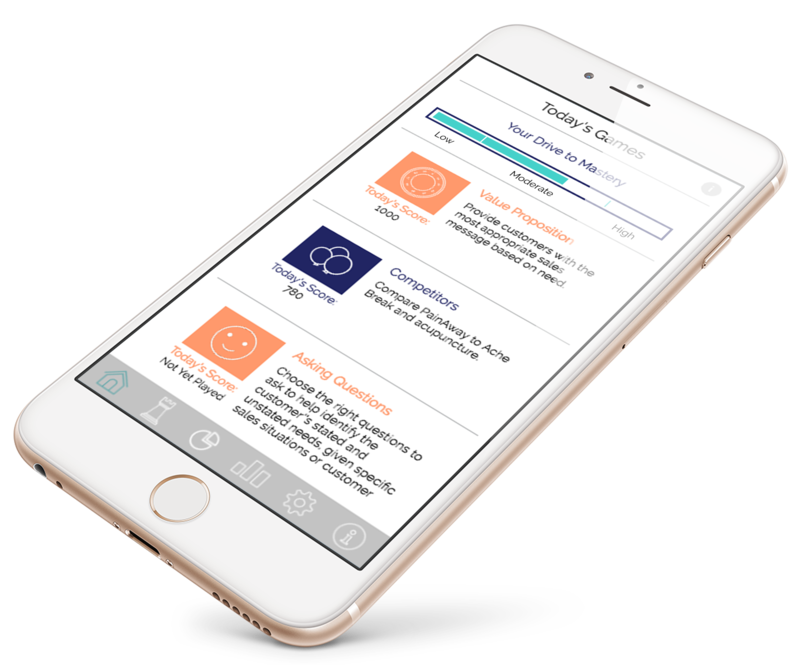 Drive’s confidence assessment allows you to accurately gauge your reps’ confidence in key areas and grow it alongside their knowledge and skills. Drive incorporates spaced repetition and feedback loops to maximize knowledge retention. Don’t just train your reps. Ensure your reps are saying the right thing at the right time. See how Drive works for product knowledge. Knowledge Guru is a platform of apps that use game-based learning, adaptive learning and micro-learning to increase knowledge retention and improve performance. Organizations use Knowledge Guru to reinforce training after product launches, introduce new processes and onboard employees. The Knowledge Guru platform has received five Brandon Hall Excellence awards, including “Gold” for Best Advance in Gaming or Simulation Technology and Best Advance in Online Sales Training. It was created by Bottom-Line Performance, a custom learning solutions provider founded in 1995. Let us give you a full tour of the app.